Leading scientists present their best methods and analyses. Extended papers are then published in the open access, fully indexed conference proceedings at Biology Direct. 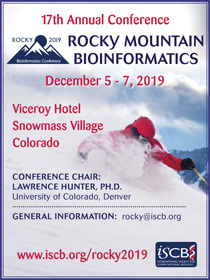 Register today for the second annual ISCB SRG - SE USA Symposium on Computational Biology. Join us on December 6 – 7, 2019 in St. Petersburg, Florida. For more information, please visit http://rsg-se-usa.iscbsc.org/. ISMB/ECCB 2019: Call for Abstract Submissions! 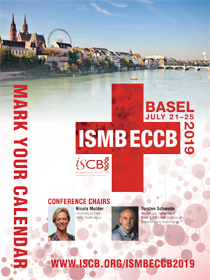 Register for ISMB/ECCB 2019 & Book Your Hotel! Building on the success of the 2018 Advanced Bioinformatics Workshop (20-24 August 2018), we will be running the workshop again this year, focusing on both Machine Learning approaches in Bioinformatics, as well as automating the pipelines through the use of technologies such as CWL and Docker. 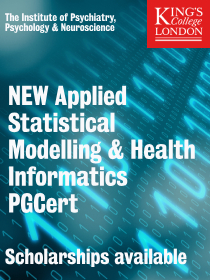 Confirmed instructors are: Fotis E. Psomopoulos (ELIXIR), Amel Ghouila (H3ABioNet). Register today for the ELIXIR | CODATA-RDA Advanced Bioinformatics Workshop - Application is open, the deadline is April 18. 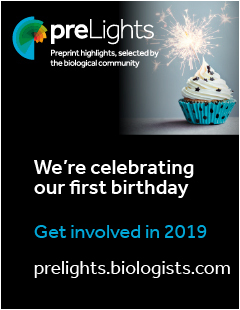 Register for GLBIO 2019 & Save! Don't be left wishing you were involved in this high level conference! 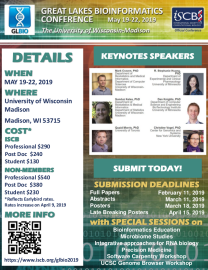 Submit high quality research to the 13th Great Lakes Bioinformatics Conference (an official conference of the International Society for Computational Biology).